Running on Linux is a little bit challenging for music recording but luckily, there are few softwares that are specifically built for Linux that are performing at par or even well with its Mac or PC counterpart. One of those applications is Rosegarden. Now on its 4th version, Rosegarden is a Midi sequencer specifically built for Linux. Recently updated, the latest version of Rosegarden is better than ever. Aside from the fact that it's built for Linux, it is also one of the oldest applications for the Operating system. The earliest version of Rosegarden was first released 14 years ago. 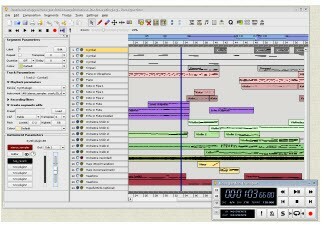 It used to be a Midi Sequencer only but it became a powerful score editor as well after more than a decade. Looping and sequencing is never a problem with this application. Users can edit tracks by notation or if you're leaning is on beats, then you can use the Midi matrix editor which eases interaction. Over the years Rosegarden has also attracted additional developers to help the software increase their functions. Plug-ins are now available for additional functions such as DX7 Emulator called Hexter and additional synth tools from WhySynth. LADSPA, DSSI, VST and VSTi plug-ins could be integrated in Rosegarden-4. If there's anything to complain about the software, its the interface. Yes, it could be easily understood but it does warrant additional sizing options so that interaction with more plug-ins and features could be available. Of course there is always the standard question on when will this powerful sequencer come out with Windows and/or Mac version.